Gee, is there no easy way? 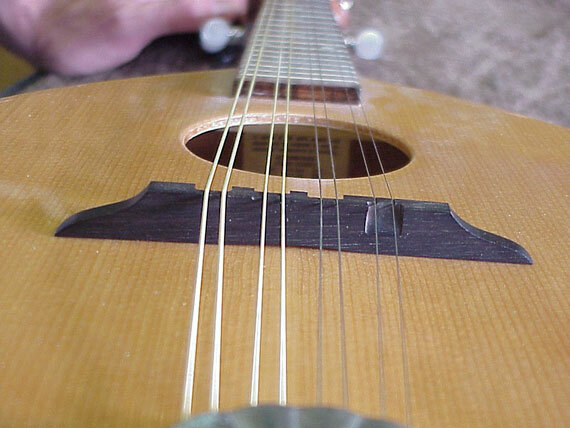 It seems as though no two archtop instruments have tops with the same arch. 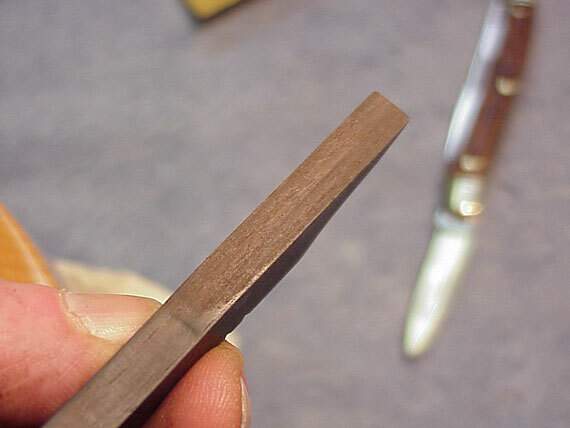 When it comes time to replace a bridge, or adjust its height by cutting material from the bottom, it's also time to fit the feet to the curvature of the instrument top. Individual luthiers may fit their bridges by hand, where factories will generally have mechanical means of automating the process. 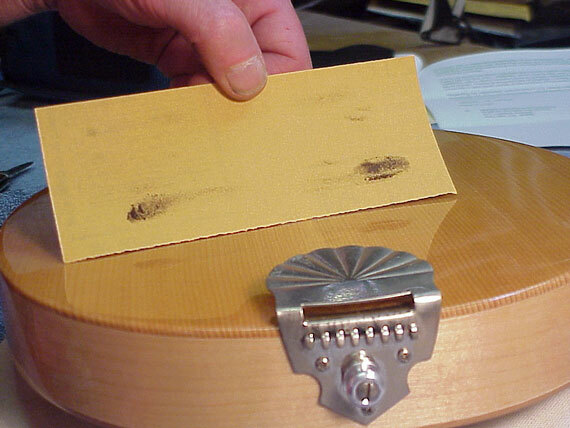 Some players and luthiers are convinced that a perfect contact between the feet of the bridge and the top of an instrument is crucial to good tone. I'm still skeptical, but I do believe that if the feet don't fit reasonably well the instrument doesn't even look right. And, an ill-fitted bridge is bound to place small strains on areas of the top, possibly making dents and valleys in the soft spruce. 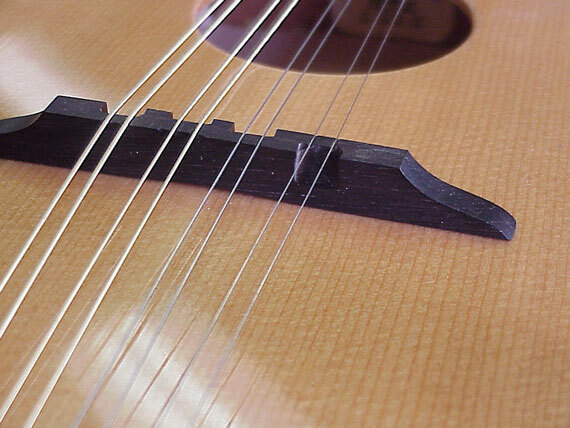 So, regardless of how you feel about the concept of splitting hairs over tone, I think we can all agree that a good fitting bridge is basically a reasonable goal. So, how to do the job expediently and accurately, that's the question. Conventional wisdom is that you simply lay a hunk of sandpaper on the top and scrub the bridge around until the feet fit perfectly. That works well, provided you can hold the bridge rigidly without tipping, and provided that the top is perfectly uniform. Unfortunately, instrument tops are only uniform when they are new. As they age, dents frequently appear under the bridge. 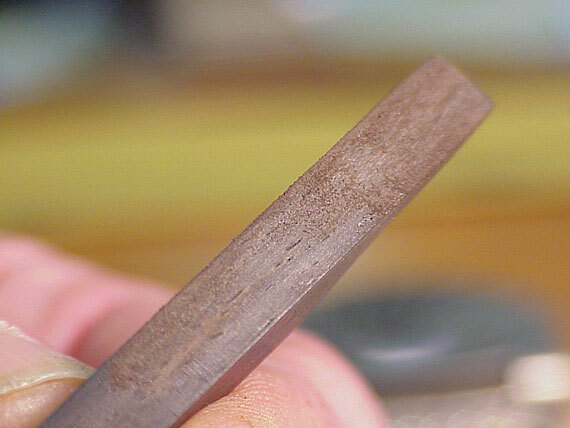 When you rub a bridge around on that surface covered with sandpaper, you tend to round the ends of the feet so that things never get to fitting correctly. 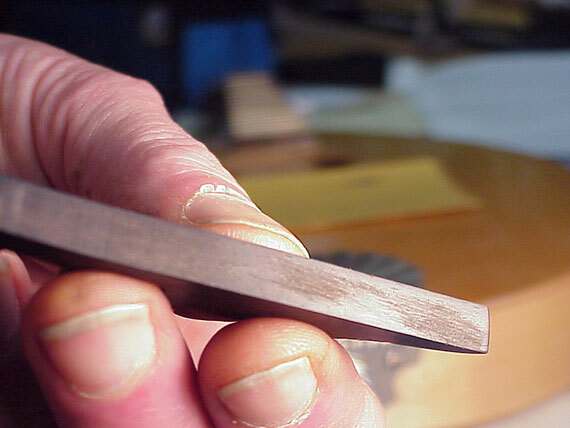 Don MacRostie, master mandolin maker and chief tool brain at Stewart MacDonald, tells me they will have a special fixture available soon for holding bridges as they are fitted with the sandpaper method. Today (July 7, 2000) he sent me a prototype which I have reviewed here. 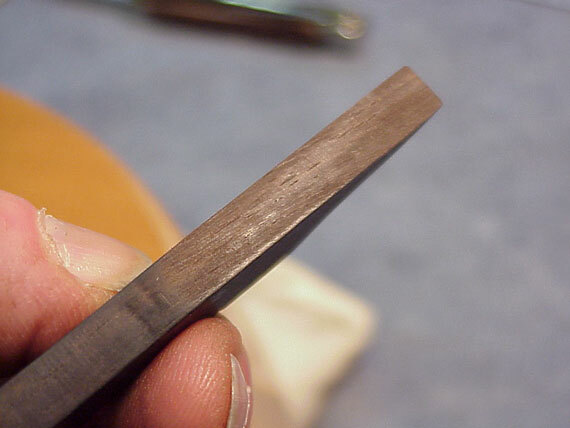 Some super traditional violin makers insist that sanding bridge feet somehow interferes with the tone transfer because micro fibers are mashed over in the process of sanding. These guys do all their fitting with knives to slice the wood on the bottom of bridges. So far, I haven't met a mandolin or guitar mechanic who goes that far in pursuing the theoretical. I suppose I've borrowed a bit from the violin community and from the guitar crowd. Here's how I go about the job of fitting up a bridge. The instrument in question is an older Flatiron 1N mandolin. Although the top looks flat, it isn't. In fact, it's just as difficult to fit to this shape top as it is to a more arched one. I use this same technique for archtop instruments, whether guitar, mandolin or string bass. 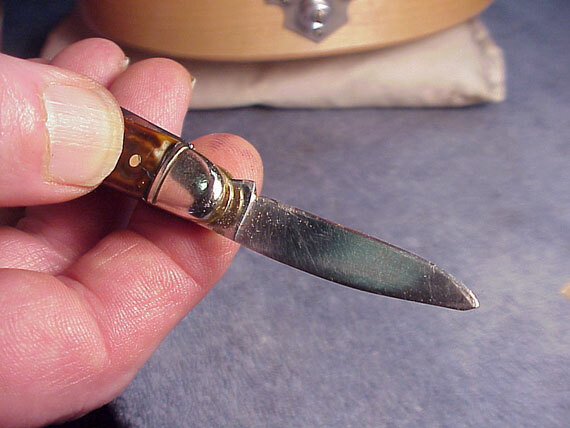 My weapon of choice: the rounded middle size blade on my Case "Whittler." I've met any number of repairers who don't carry a pocket knife. I don't understand these people. Mine is with me always! This is the blade I keep razor sharp for special jobs. I'm using some 280 grit sandpaper. I don't tape it down, I just hold it in position. And, I rub the bridge just a couple of strokes sideways, about 1/8", pressing downward as evenly as I can, keeping the bridge from rocking sideways by holding it below the center of gravity at the ends. See how short my sanding track is? If the top is badly dimpled, I'll rub it for as short a distance as I can. The idea is not to try to hog off a lot of material, but just to scuff the bottom of the bridge a bit. If the top were terribly dented by the bridge and I had no room to maneuver, I'd use a bit of chalk on the surface, and just pick up bits on the bridge feet to see where it touches. This is my result. You can see the shiny original surface, and my little sanding scuffs in two places. Those are, of course, the two places where the bridge foot actually touches. When the instrument is tuned, the bridge may make contact all along, but I know I'll get the best fit if I get it to look right without any string tension. OK, out comes the high tech secret weapon. 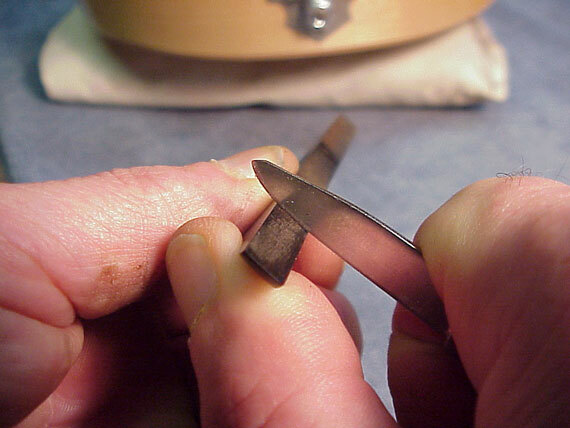 I'm holding the blade, using my thumb as a "fence" as I scrape the bridge foot bottom along, creating a slight hollow in the foot. 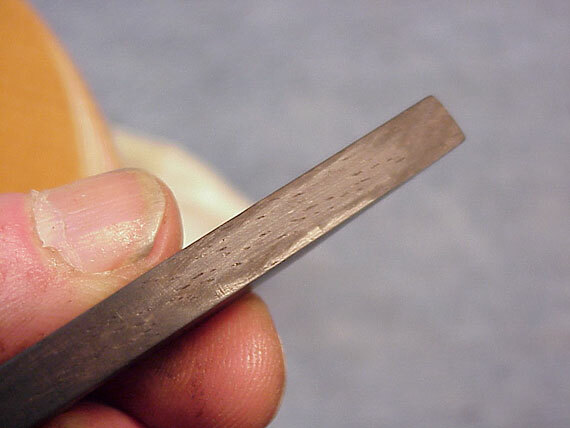 The curvature of the blade makes this an easy job, and it keeps me from digging too deep as I scrape. If I want a bit more power, I'll use a "paring" grip, holding the bridge still, and scraping the blade along, taking a deeper cut. See how it looks now. I have hollowed the foot ever so slightly all along the length where it touches the top of the instrument, and as close to the edges as I can come without slipping off. By the way, I scraped a bit extra in the scuffed areas where I identified the original fit. Even there, I didn't go off the edge though. Just a quick couple of swipes, and I have a broad scuff at the end of the foot. Back to scrape that area hollow, and repeat the process of scuffing. From time to time, I'll polish the bottom of the feet, usually with a quick pass on my buffer with the black metal polishing compound on the wheel. I can approximate that polish by rubbing hard on my shop apron, or with some Micro Mesh abrasive cloth. Polishing the surface makes the scuff marks show up nicely. 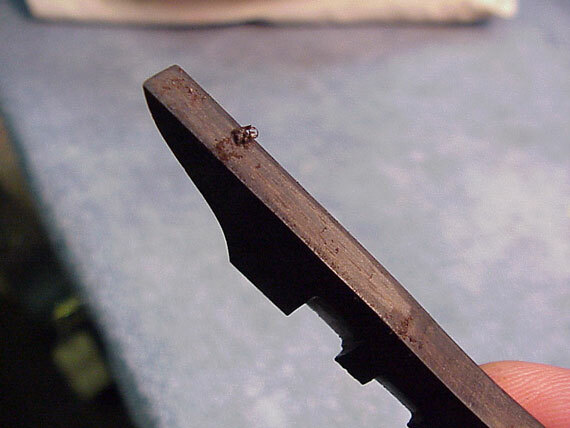 If I hollow the feet (very shallow) the bridge will not tend to rock as I sand against the instrument top. Also, I'll be able to sand quickly and easily to get the feet to mold to the shape of the top. This view shows a further fitting where the sanding scuffs cover more than half the surface. 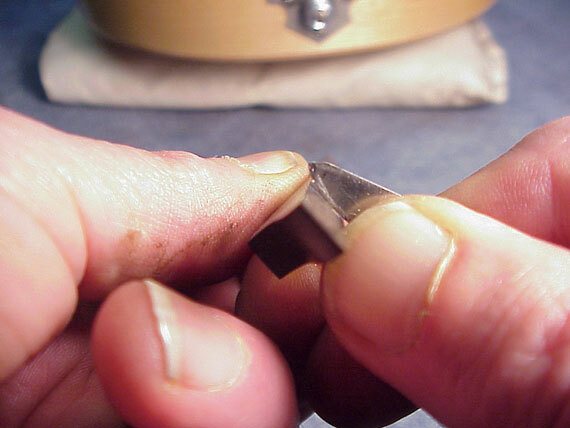 Scrape lightly again, scuff again, each time scraping the entire surface hollow, but leaving the outside edges alone, letting the sandpaper work its magic on that precious few thousandths of an inch. Now I'm really getting somewhere. The foot is getting scuffed all along the edges, fore and aft, port and starboard. This time, I won't hollow the area any more. In fact, I could leave it alone, and have a good looking, and in my opinion, a good fitting bridge. But, just a couple more short strokes and I get the best possible look, scuffed all over. Well, almost all. If you look closely you'll see a bit of a shiny area on the lower right edge. That's such a small space, I'll call it "good enough." Back in place, and tuned up. The bridge looks like it should, well fitted to the top. While this bridge has two distinct foot areas, some have a solid base with no gap in the middle. My fitting technique is just the same for those.